We as a band are doing everything we can to introduce our beloved Lebanon to each &amp;amp; every country throughout the world &amp;amp; we&amp;#039;re doing that through the power of music. We want them to know that Lebanese People are Talented, Sensitive, &amp;amp; Peace Loving. Our song &amp;quot;No Place Like Home&amp;quot; (Running Free in Lebanon) is perhaps one of the best songs ever written about Lebanon. We were so fortunate to have been able to write such a song. It’s a song that is capable of stirring all kinds of emotions of every Lebanese on this planet. Once people hear it, they just wanna pack up and go back to visit the land that will always and forever captivate their hearts. The land of Lebanon. Music is the glue that bonds us all together. It will always and forever inspire each and every one of us through colors of Rainbow intertwining with waves of emotions hanging on a thread holding on to the stillness of a quiet night with a sky full of uncharted vision. D.T.A stands for Doors To Aspiration. We hope that we can be the doors our youth need to go through in order to be motivated. Hopefully we can be the doors to the bridge that we need to cross so we can get to the shores of our bright future. To watch our videos &amp;amp; listen to our songs, Hit the following link &amp;amp; then click on “Boxes” right next to our picture. Watch, listen &amp;amp; enjoy. 12 Videos to watch &amp;amp; 16 Original D.T.A songs to listen to. Including our biggset hit &amp;quot;Running Free In Lebanon&amp;quot; (No Place Like Home). Please join our *** FACEBOOK *** group and spread the word around about it. With your support, we can reach the stars. We as a band are doing everything we can to introduce our beloved Lebanon to each & every country throughout the world & we're doing that through the power of music. We want them to know that Lebanese People are Talented, Sensitive, & Peace Loving. Our song "No Place Like Home" (Running Free in Lebanon) is perhaps one of the best songs ever written about Lebanon. We were so fortunate to have been able to write such a song. It’s a song that is capable of stirring all kinds of emotions of every Lebanese on this planet. Once people hear it, they just wanna pack up and go back to visit the land that will always and forever captivate their hearts. The land of Lebanon. Music is the glue that bonds us all together. It will always and forever inspire each and every one of us through colors of Rainbow intertwining with waves of emotions hanging on a thread holding on to the stillness of a quiet night with a sky full of uncharted vision. D.T.A stands for Doors To Aspiration. We hope that we can be the doors our youth need to go through in order to be motivated. Hopefully we can be the doors to the bridge that we need to cross so we can get to the shores of our bright future. To watch our videos & listen to our songs, Hit the following link & then click on “Boxes” right next to our picture. Watch, listen & enjoy. 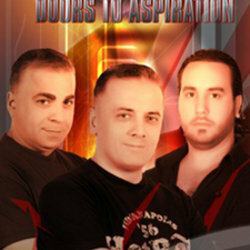 http://www.facebook.com/pages/Doors-To-Aspiration/16795705826 12 Videos to watch & 16 Original D.T.A songs to listen to. Including our biggset hit "Running Free In Lebanon" (No Place Like Home). Please dedicate it to all your friends. They’ll love it. We hope you & your friends become fans too. You can do that here: http://www.facebook.com/pages/Doors-To-Aspiration/16795705826 If you like to use *** YOUTUBE ***, here’s the link to 8 of our videos: http://www.youtube.com/DoorsToAspiration Please join our *** FACEBOOK *** group and spread the word around about it. http://www.facebook.com/home.php#/group.php?gid=73722034452 With your support, we can reach the stars.